With Hallyu spreading Korean culture across the world, the popularity of Korean movies, TV shows and music has been attracting foreign tourists to the country. 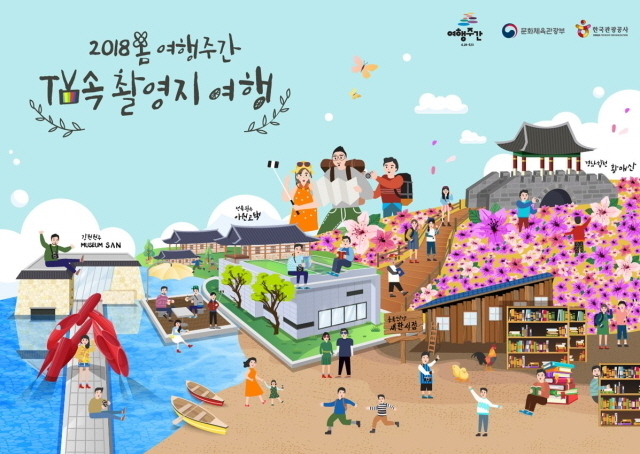 Capitalizing on this trend, the Ministry of Culture, Sports and Tourism on Tuesday launched plans for this year’s Spring Travel Week -- 16 days in late April and early May designated to introduce travel destinations and programs based on locations featured in popular Korean movies and TV shows. Travel Week, which started in 2014, is a government-led tourism campaign comprising spring and autumn editions. This year’s campaign consists of travel programs in Busan, Daegu and Ulsan, along with Gyeonggi, North Chungcheong, South Jeolla, South Gyeongsang provinces and Jeju Island. The other 10 regional governments in Korea are slated to participate in the Travel Week taking place in autumn. Regional travel programs include a tour around famous filming spots in Busan, Daegu and South Gyeongsang Province. “Happiness of 10,000 won” is a program that allows participants to visit tourist spots and traditional markets with 10,000 won ($9.30). Temple stay programs at 103 temples across the country also cost 10,000 won. Applications for the program can be made from 11 a.m. on April 18 to 11.am. on May 12. Discounts at tourist spots in Seoul and Gyeonggi Province are also available, including the amusement parks Everland and Seoulland, the four palaces in Seoul, museums and galleries. For more information on Travel Week, including applications, visit travelweek.visitkorea.or.kr.